Living in the wilderness for a long period of time had been my lifelong dream. 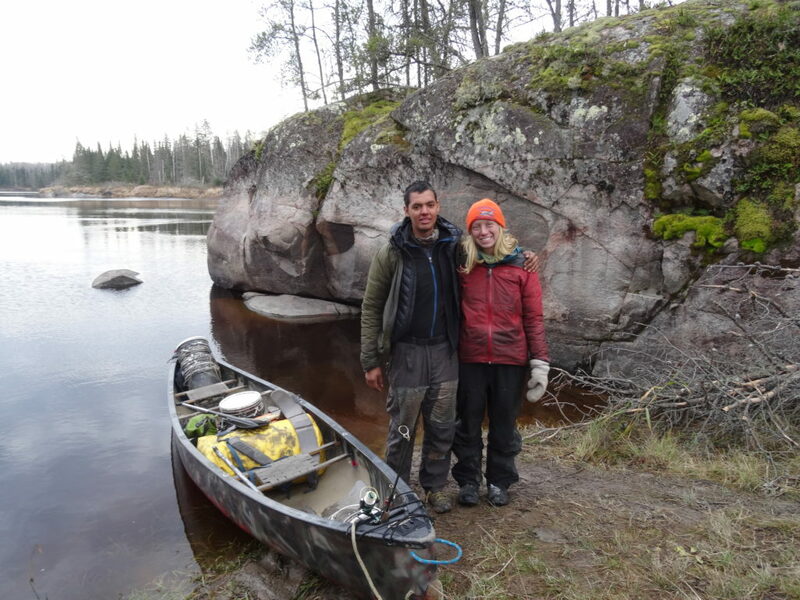 On May 18th, 2016, Jennifer Ford and I got our two portage packs, six buckets, and paddling gear inside our canoe and paddled into the boreal forest of Manitoba with the intention of spending half a year there. We launched into the unknown. In the post Why would any of us want to live like a savage? I describe the reasons for our adventure. We had planned the adventure in the six months prior. Researching anything we could find, and using bits and pieces of advice from many sources. The plan was to bring half the calories needed to survive. During World War II there was a semi starvation experiment in Minnesota in which volunteers ate, half the calories they usually ate, for 6 months. At the end they were very very thin, but they were fine. We figured we would be far better than them because we would complement our rations with food from the forest. In addition, we had to be in good condition for the trip back to civilization. We brought around 200 pounds of food divided in six pails, which amounted to around half a pound of food per person, per day. It consisted of flour, basmati brown rice, oil, salt, whole milk powder, honey, baking powder, and yeast (perishable). We rationed the food strictly and consistently throughout the whole trip. The first few days we were shocked by how meagre the rations seemed. After some time, we got used to them more or less. We had to savour and cherish every single bite because some days it was all we got. For instance, our daily portion of rice amounted to less than half a cup of uncooked rice to be shared by both of us. We had chosen a lake close to the Bloodvein River in Atikaki Provincial Park for our adventure. But before reaching the Bloodvein we had to portage the infamous Obukowin portage which is 3.1 miles long. It took us two days to complete the portage, and it involved lots of mosquitoes, sweat, and mud. We discovered one thousand and one ways to carry a bucket. After that odyssey we continued along the Gammon River until we joined the Bloodvein. I had discovered what seemed like a trail in aerial photographs. The 1 mile trail turned out to be a snowmobiling trail. It was submerged. The water was cold and the going was super slow. In fact we could not portage the canoe, we had to drag it the whole time because the flooded trail wouldn’t allow us to remain standing up. It was one of the hardest portages we had ever done. We had to leave 5 buckets buried underground at the start of the portage. It took us two days to get to the secluded lake. Once in the lake, we immediately started to look for a good site were we could establish our main camp. We fished full time the first few days, yet we didn’t have a single bite, or saw any fish jump. We knew there were minnows but we could find no traces of fish. By the end of the third day we decided to pull out, we would just end up loosing energy that we required for the incredibly hard portage. I had seen another snowmobile route out of the lake, so we decided to scout it. We decided to get back into the Bloodvein river using that trail. It was another hard portage but easier than the other trail. We got into the river and paddled downstream towards the buckets we had cached. We retrieved them and decided to paddle up river and check out a location that we had spotted on our topographic map. It took 5 days of slow paddling. The first fish we caught in our trip was very small. We considered returning it for a moment but quickly dismissed the idea. At another campsite I caught a catfish. It took me a long time to fillet it, and I wasn’t sure how to do it. Little did we know that we would be catching mainly catfish for the next 6 months. 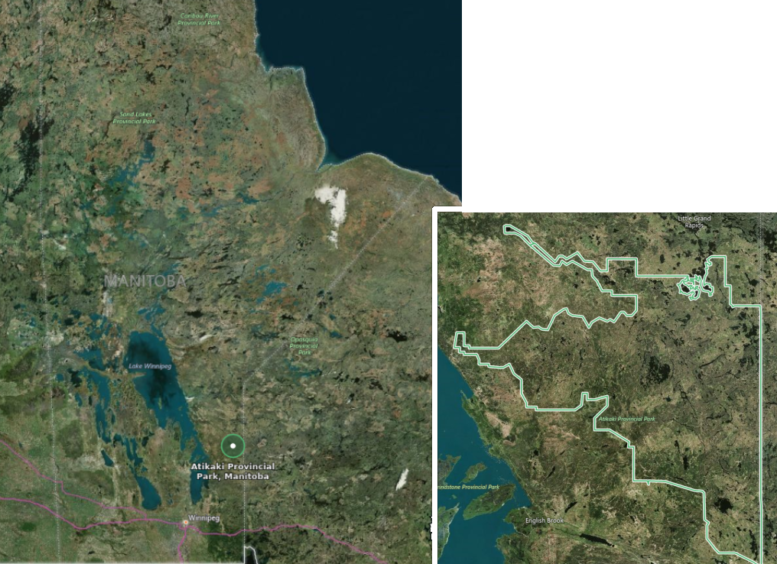 We got to what looks like an oxbow lake, this area is still connected to the Bloodvein. This meant we didn’t have to portage into it. It also meant that the fishing was much better. We found a promising spot, and the next day I set out to fish. I got bites almost immediately and lost a few hooks because I didn’t use a leader. The next day I caught a fish right from our campsite, and then we knew that was the place to be. We cached our buckets in an island nearby. Our campsite was out of sight from the Bloodvein. We built a tripod on top of our tent to protect us from falling trees. We placed our tent into the forest far from our hang out. We set a site for a fire and placed a flat rock besides it to serve as a table. Surprisingly, when the sun was out we would have no problems with mosquitoes in the area were we cooked. We did have lots of horse flies there. 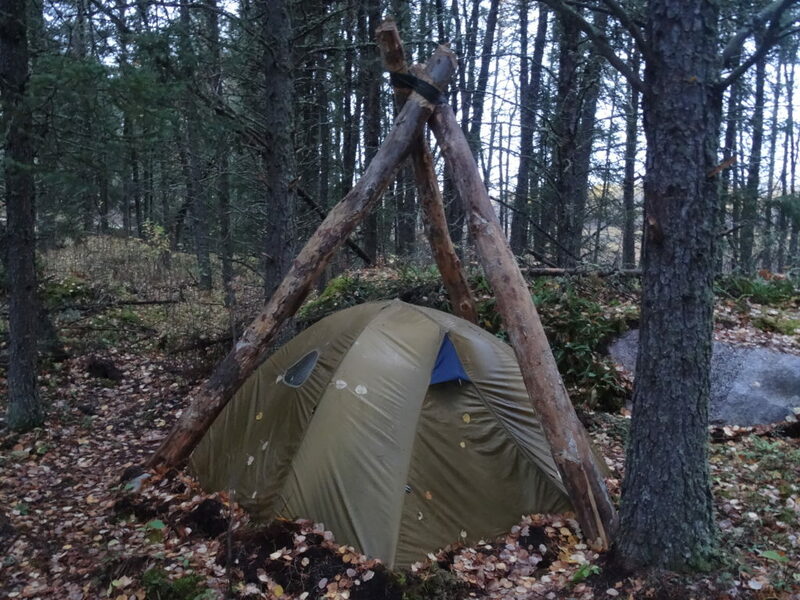 There was a nice spot for a lean-to shelter and we decided to build a simple one to spend the day and take shelter from the rain. We used a design that didn’t need any wire or cord. We built a bench/bed using logs, and we used Y shaped branches to support the structures. 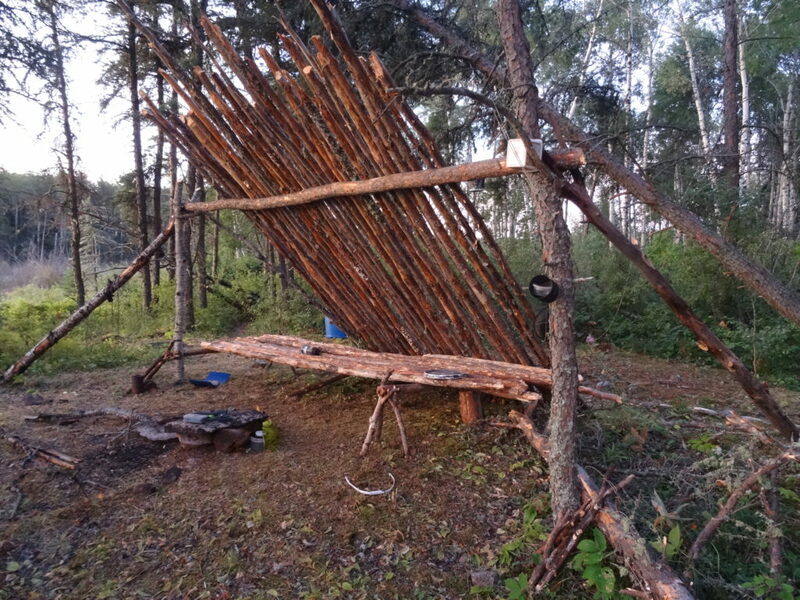 We initially had planned to cover the shelter with spruce branches but decided instead to use the least amount of energy and just use a tarp instead. 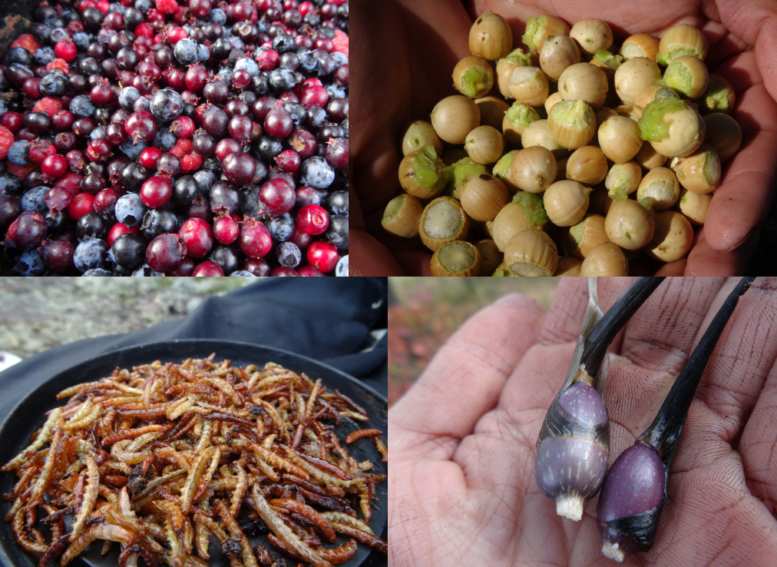 The main sources of local food were fish, berries, and wild rice. Berries were plentiful but didn’t have many calories. There were many days without food to complement our rations. In those days we drank lots of spruce tea to fill up our stomachs. The longest we went without wild food was a week after the biggest storm of the year. I passed out twice in a day during that week. Overall we rarely felt really full. We had chronic hunger. We dreamt of food very often. I think I lost around thirty pounds. We spent a lot of time sleeping and sitting by the fire. The pace of our lives really slowed down. We didn’t run in 6 months. We always used our energy wisely. Our bodies went into survival mode. Our senses were enhanced by the lack of noise, pollution, and distractions. I once saw a squirrel and had my bow nearby. We were hungry that day so I decided to shoot it. When I was about to aim, I saw an eye. I thought it was a rabbit so I shot towards it. If it weren’t for that squirrel I wouldn’t have seen the rabbit that was almost perfectly camouflaged except for its eyes. In October two hunters flew in close to our camp. They spent a week there and we enjoyed their help and company. They shot a moose, and we grabbed about 30 pounds of its meat. We ate most of the meat right away, including its heart and tongue. 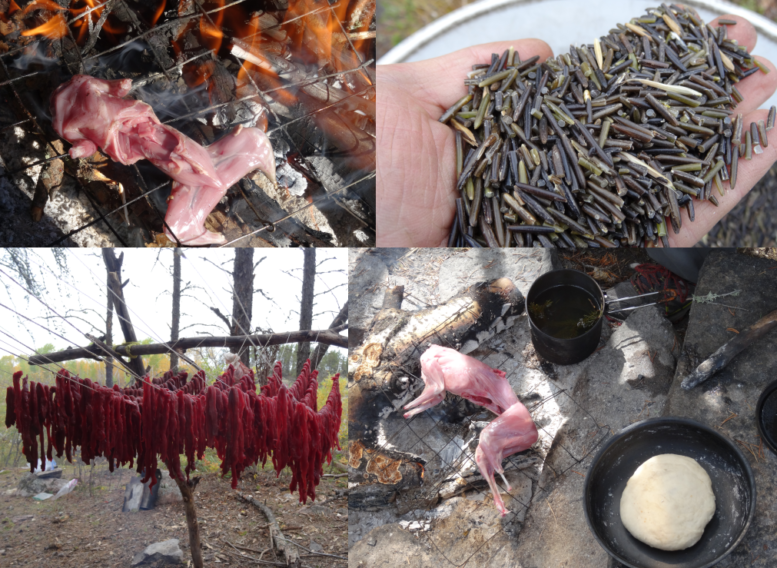 We dehydrated the rest over our fire and made jerky. Blueberry season was a huge boost for our morale. The berries we could find were blueberries, raspberries, strawberries, saskatoon berries, and bunch berries. We also ate cattail spikes, young shoots, rhizomes, roots, and pollen. We really liked the immature cattail spikes. The squirrels got most of the beaked hazelnuts. They were not big or easy to peel, but they tasted great when toasted. We wished we had harvested more wapato (arrowhead) tubers. We didn’t find great places to harvest them and they were not as abundant. The photo below also shows rice worms that were a delicious fried snack. Speaking about food, we baked something every day. 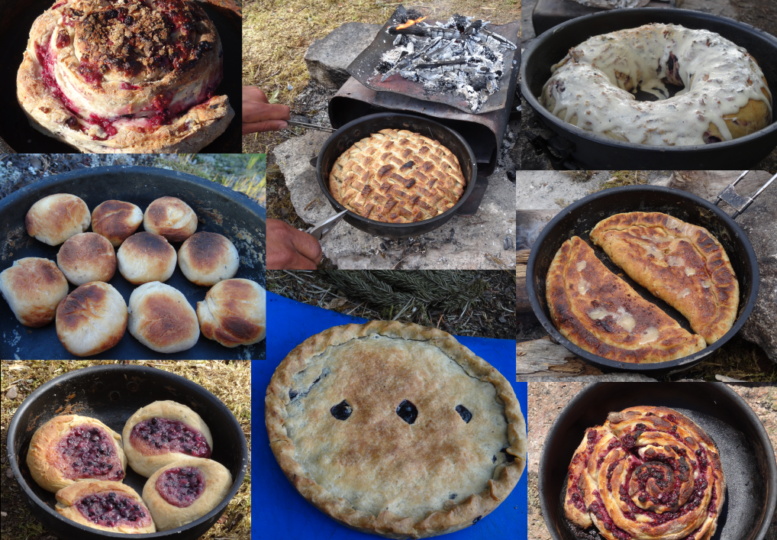 We baked pies almost every day with an oven I built from old stove fuel tins. It was exciting for us; we would take turns to bake something different every day. We often planned the recipes in our minds at night, visualizing what we would do the next morning. This gave us something to look forward to every day. And we really enjoyed it. I think it helped us a lot mentally. The local fish were Northern Pikes, Walleyes, and Catfish. But we almost exclusively caught Catfish. Sometimes we would catch one with lots of fat and we would fry it; we called them Kentuchy Fried Catfish. They were big and sometimes fat so we were always excited when we caught one. The last catfish we caught took about 45 minutes to fillet and clean; we spent a long time preparing fish. They also took a long time to cook. But we always appreciated having fish to eat. But our biggest highlight was discovering a huge patch of wild rice in a nearby lake. The lake used to be harvested commercially in the 70’s. We spent three days knocking rice. It took us one month to process 66 lbs of finished rice. We worked on it only occasionally and did every part of the process manually; separating the hulls from the rice is what makes up most of the work. 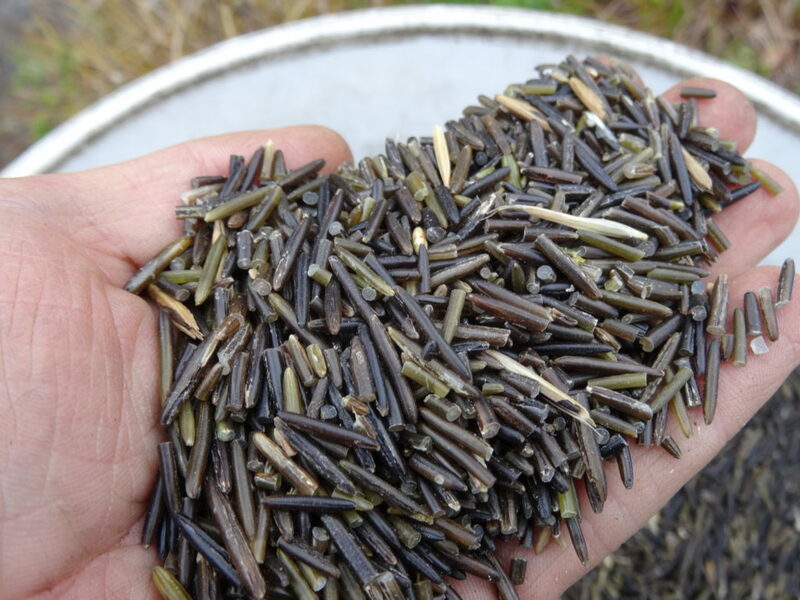 Wild rice was the main staple of many Ojibway groups in the bio region, so we knew it was important to harvest a lot of it. We will never forget this life changing experience. We are learning to be more simple, mindful, thankful, and happy. We really enjoyed slowing down and living at an enjoyable pace. It was very hard and challenging to deal with our isolation (and being together 24/7), and chronic hunger. But in the end the lessons we learned and are learning are making a great impact in our lives. We are thankful for the privilege of being able to have such an adventure, and we hope that we can inspire and support people to strengthen their relationship with nature. We need people to fall in love with it. 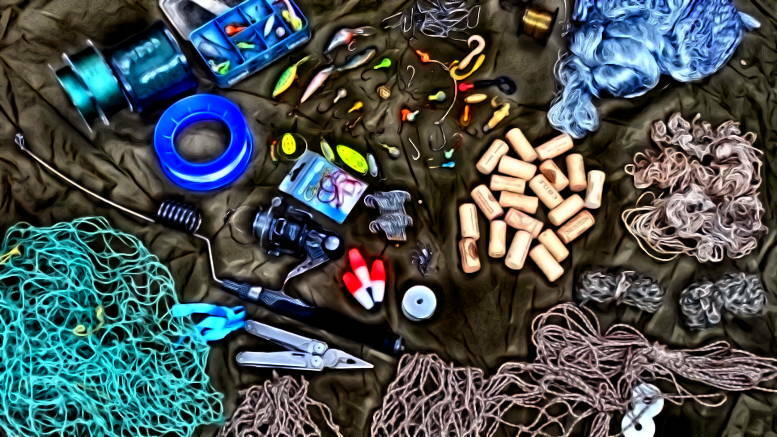 I am creating this website to be a resource for people wanting to plan a similar adventure, or people interested in bugging out for long term wilderness survival. 3 Comments on "Six Months In The Wilderness"
That’s just extraordinary what you two did. Amazing! Thank you very much for sharing this online. Agree – thanks for sharing your adventure! What an amazing experience. I know my 66 days on Vancouver Island was life changing.